Descriptions such as “a holiday classic” or “must-see theatre” have been used so frequently that they seem hyperbolic this time of year. This isn’t the case with Lost & Found Theatre’s latest production: Charles Dickens Writes A Christmas Carol. If tonight’s performance is any indicator, this play is destined to be a Christmas classic and certainly is must-see theatre for the few performances that remain. Written by L&F company member Richard Quesnel, Charles Dickens Writes A Christmas Carol tells the story behind the now-classic story of the redemption of Ebenezer Scrooge. 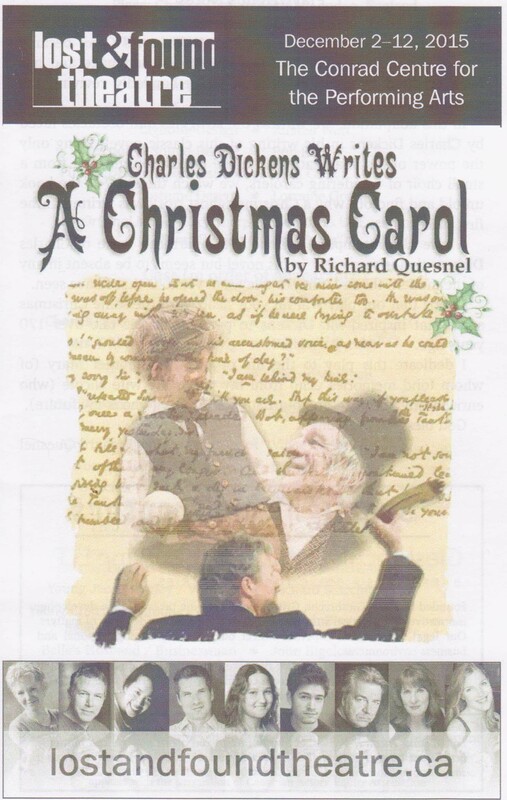 “Written in 1843, a time when the celebration of Christmas was considered out of fashion in London, A Christmas Carol became one of the most popular books of the English language and has been credited by some as ‘almost single-handedly reviving the Christmas holiday'” writes Quesnel in the playwright’s notes. The play depicts the challenges Dickens (Gareth Potter) faced in providing his publisher with a story as successful as The Pickwick Papers – which had been published seven years earlier. Drawing inspiration from a group of carollers and a tightfisted publisher who insisted on new and publishable work by Christmas morning, Dickens slaves through the night to produce A Christmas Carol. Quesnel, who also directed the play, seamlessly weaves the story of how Dickens crafted the story with the story itself. Potter assumes the role of both Dickens and Bob Crachit while L&F company member Christy Ziss is memorable as Mrs. Dickens and Mrs. Cratchit. Both veteran actor Ted Follows (Jacob Marley/Old Joe) and L&F’s Kathleen Sheehy (Mrs. Dilber/Mrs. Fezziwig) are unforgettable. For me, the challenge of any actor depicting Ebenezer Scrooge is meeting the standard set by Alistair Sim in the 1951 film Scrooge. Vince Carlin’s portrayal of Mr. Hall/Scrooge meets and, dare I admit it, exceeds that standard. In his own way, Carlin shows Scrooge’s self-centred approach to life in which only his business is preeminent. By the end of the visits of the three spirits, Carlin is able to demonstrate Scrooge’s repentance in which mankind becomes his business. From a cast which effectively handles British accents and Victorian dialogue, to a simple set which transforms itself from Dickens’ study to the Cratchit’s cottage to Scrooge’s bedroom, the play shines. A particularly memorable scene, often missing from film versions of the story, is the Ghost of Christmas Present’s visit to those celebrating Christmas: a pair of miners, a lighthouse keeper and those aboard a ship at sea. Under Quesnel’s direction, the scene features carols in German, French, another language I couldn’t quite catch and ends with an English version of the the traditional Austrian carol “Still, Still, Still” in a moment which brought the audience, including myself, to tears. The acting is superb. The set is stunning. The original music is moving. Charles Dickens Writes A Christmas Carol will become a Christmas tradition. And that’s a prediction, not hyperbole. Bob Crachi is missing a “t”. Thank you for catching that error. It’s been corrected. I hope you also enjoyed the play.